Army Spc. Allen Levi Stigler Jr.
22, of Arlington, Texas, died Aug. 13, 2017, in Iraq of wounds sustained while engaged in combat operations. He was assigned to 2nd Battalion, 319th Airborne Field Artillery Regiment, 2nd Brigade Combat Team, 82nd Airborne Division, Fort Bragg, North Carolina. The incident is under investigation. The Pentagon has released the names of two soldiers who died Sunday in Iraq while supporting Operation Inherent Resolve. Sgt. Roshain Euvince Brooks and Spc. Allen Levi Stigler Jr. died of wounds sustained while engaging the enemy with artillery, the Defense Department and the Army announced in statements Monday evening. Both soldiers were canon crewmembers assigned to 2nd Battalion, 319th Airborne Field Artillery Regiment, 2nd Brigade Combat Team, 82nd Airborne Division. They were stationed at Fort Bragg, North Carolina. Stigler was posthumously promoted to sergeant. Five other soldiers were injured in the same incident. Earlier on Monday, Pentagon spokesman Col. Rob Manning said an Army artillery section was conducting a counter-fire mission against an ISIS mortar site when a mishap occurred, injuring seven soldiers. The other five soldiers did not suffer life-threatening injuries, Manning said. He did not know if the artillery equipment misfired or if the mishap was the result of human error. The incident is under investigation, and no further details were released Monday evening. 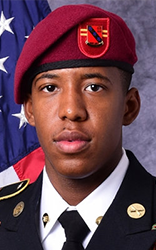 Brooks, 30, was from Brooklyn, New York, according to information from the 82nd Airborne Division. He joined the Army in July 2012 and served at Fort Hood, Texas, before arriving at the 82nd Airborne Division and Fort Bragg. He deployed to Afghanistan from June to November 2014. This was his first deployment to Iraq. Stigler was 22 and from Arlington, Texas. He joined the Army in November 2013 and served in South Korea from May 2014 to June 2015. In July 2015, he was assigned to the 82nd Airborne Division. Stigler was on his first combat deployment. Both Brooks and Stigler were posthumously awarded the Bronze Star, Purple Heart, Meritorious Service Medal and Combat Action Badge. Pentagon bureau chief Tara Copp contributed to this report.